The European Championship hosts continued their Friendly games, securing another victory(fourth in a row) in Copenhagen, versus an opponent who began the encounter under a cloud of disappointment after Albania’s 3-0 win vs Armenia, earlier in the afternoon. 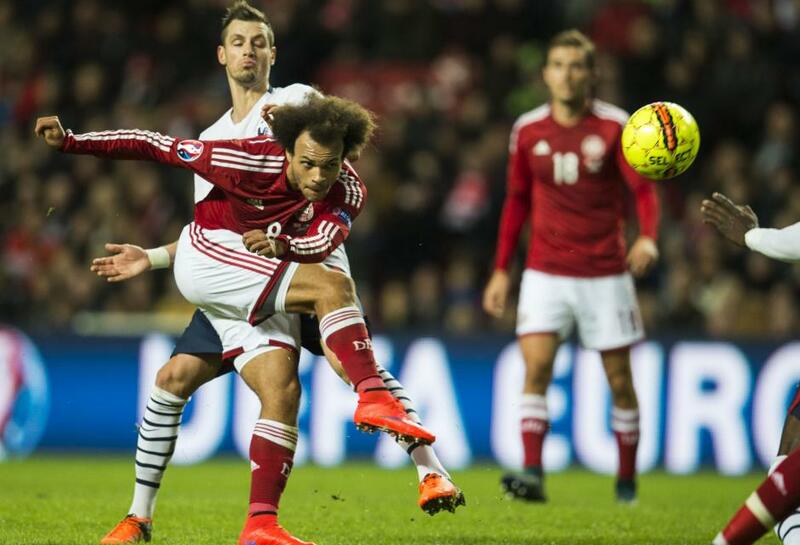 This result is forcing Denmark to fight for a place in the Final stage by wining the play-offs in November. France were two up only six minutes after the game’s start, (Giroud’s brace) but the Danish goalkeeper Kasper Schmeicher was unconvincing in both occasions. Denmark scored one back in stoppage time when Sviatchenko smashed the ball into the top left corner, from 30 yards, but it was too late for the hosts to hope for another result than another defeat. A night to forget for Leicester’s goalie; two terrible pieces of handling during the first 6 minutes, gave France the win. Had an awful evening; Martial and Griezmann had a large avenue to pass and attack; he just was unable to give them any trouble, especially in the first half. He was at fault for Giroud’s first; unable to keep the French at bay, poor reading of the game. Good effort, especially keeping some crosses out of the danger area. He gave too much space thus permitting the French several good crosses. The Dane has just come back from injury, but played well with Tottenham, scoring twice. Nevertheless, he wasn’t his usual self; enable to link with his teammates and his only shot on goal was blocked. How many times did he touch the ball, no more than a handful, at best. A game to forget for the Dane International. Unable to help the Dane defense, anonymous especially during the first half. Was he on the pitch ? His presence didn’t bother at all the french midfielders. A game to forget; he didn’t( or couldn’t) do nothing as he was isolated on the wing. The Dane forward wasn’t able to do his trade, thanks to his teammates lack of service. A special note for E. Sviatchenko and his wonder goal late on; an interesting cameo, more to come ? A bad clearance in the first half, shaky distribution, maybe wrong-footed for the Danish goal, but it would be unfair to ask more from Marceille’s Captain. He was never under pressure from the Danes, just an ordinary day at the office for Manchester’s City’s defender. Subbed by K. Zouma. Good performance for the French Captain(Lloris was rested). His technical ease and recovery pace helped him to make two crucial blocks and almost score. Subbed at half time. Not his usual self; he found himself in several good positions, but he wasn’t able to take any advantage. Poor crossing, too. More efficient than his teammate Jallet, played some good crosses and was present for the second goal. Average game, but he did some good deeds using his stamina to prevent Denmark’s incursions on the french side. Responsable, tonic player, good ball distribution and generally did a good job mopping up at the midfield base. Quiet during the first half, he put on an energetic performance during the second half and paired well with Martial. He didn’t have his usual technical accuracy, though. Two easy goals, one might say, nevertheless he scored them; maybe this game will give him back his confidence and help him to come back as number one striker in his club? He missed the third and that was 100% his own fault. Who cares how many millions Manchester United paid to sign him ? The teenager is securing a place in the french team, en route for EURO 16. The young striker showed his class, his playmaking quality, set up Giroud’s first goal and almost scored ; too bad that it wasn’t accurate, but it will be in the near future. The Athletico’s goalscorer showed again his high-class ; he wasn’t decisive but he’s able to combine and participate actively in the game. ‹ Ten Young Promising French Players: Don’t Forget Their Name !